What is Tianmen Mountain (Ziyuan)? Tianmen Mountain (Ziyuan) is less popular than the Tianmen Mountain in Zhangjiajie as it is located in Ziyuan countryside, nearly 155 kilometers from Guilin (approximately 3 hours drive from Guilin City). 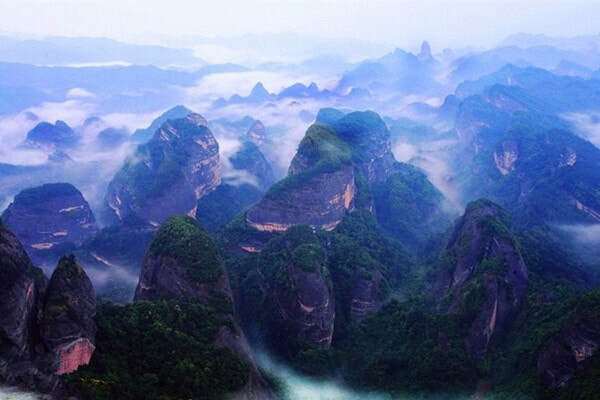 Visitors to Guilin are amazed at the Thin Strip of Sky, countless herbs, steep cliffs and its quiet environment as well as hanging glass viewpoint at the Tianmen Mountain (Ziyuan) Scenic Area. On the top of Tianmen Mountain with a height of 630 meters is a primitive forest covering an area of 5.73 hectares, which is rare around China. The Tianmen Temple (天门寺) is hidden in the mountains for hundreds of years. The hanging glass viewpoint on the top of a cliff challenges your courage. If you are interested to study herbs, hundreds of types of herbs there can meet your research needs. If you love adventures and hiking, it is recommended that you visit TTianmen Mountain during clear, fine weather between the months of April until October. Rent a vehicle departing from Guilin or Ziyuan to Tianmen Mountain. This is the quickest and most direct option. Take a bus from Guilin North Bus Station (桂林汽车客运北站) to Ziyuan South Bus Station (资源汽车客运南站). Then transfer to Ziyuan North Bus Station (资源汽车客运北站). Then, take a local shuttle to Tianmen Mountain. The last bus from Ziyuan Bus Station (资源汽车总站) to Guilin departs at 18:00pm. Please transfer to the station by 17:30pm from Tianmen Mountain if you are planning to stay overnight in Guilin. There are local shuttles at the foot of the mountain till 17:00pm. You can take a local shuttle back to Ziyuan County. If you want your own privacy, please rent a vehicle beforehand. Please bring hiking sticks, warm clothes, enough bread or fruit, bottles of water, umbrellas, raincoat, cooling ointment and insect repellent. Opening hours: 08:30 - 17:00. Interested in visiting Tianmen Mountain (Ziyuan) on a Tour? Wendy Wei Tours offers a variety of different packaged tours as well as custom tours including Tianmen Mountain (Ziyuan), among other attractions and destinations. To find out more, please visit our Tours page or Contact Us directly to find out more.